Certain places stand out for their sustainable initiatives—San Francisco, the king when it comes to recycling, and Portland, Oregon, an epicenter for green building, come to mind. And for many, Asheville and Western North Carolina represent green zones as well. But we have the challenge that comes with being a large region trying to live up to the eco-ideals of big cities. Luckily, we aren’t backing down from that challenge. Take for example Asheville’s innovative steps to reduce its carbon footprint and Madison County’s program to match recycling pounds with money for education, our efforts are making a difference. Check out where we stand and where we’re headed. We’ve got an abundance of organizations elevating sustainability in WNC, thanks to the support of residents and community leaders who recognize that change must happen to ensure our quality of life. “There is no sales involved. 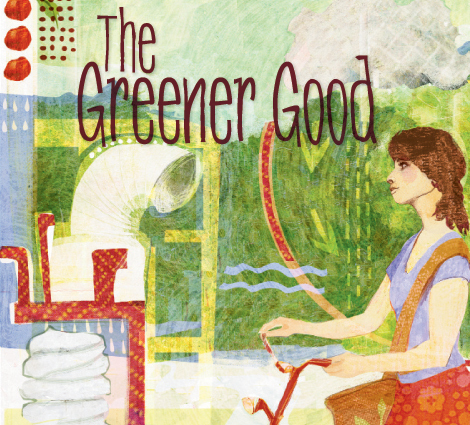 Everyone gets it and is ready for it,” says Maggie Ullman, director of Asheville’s Office of Sustainability. Here are two forward-thinking ventures aiming to improve our communities. The HUB Sustainable Community Initiative, an ambitious project headed by program director Michael Leahey, envisions “radical collaboration” between Buncombe, Haywood, Henderson, Madison, and Transylvania counties on indicators related to our core sustainability. The goal is to build a stronger community and economy by linking initiatives to improve housing, energy, transportation, and other areas that affect our quality of life. The group will find out this month if it will receive a $5 million grant from the federal government to fund the progress, so stay tuned. For more information, visit www.ashevillehub.com. In 2007, Asheville’s city government set a goal to reduce its carbon footprint by 2 percent each year, to reach an 80 percent decrease by 2050. During the first year, the city reduced its footprint by 2.5 percent. Through energy reduction methods, 867,000 kilowatt hours were saved; that’s enough energy to power City Hall for six months, which translates to a savings of $65,000. The city also shifted some employees from five eight-hour days to four 10-hour shifts per week. Now, 200 fewer people are commuting to work one day each week. Another facet of the initiative requires that all new city buildings be LEED-certified, meaning they demonstrate a measured level of energy efficiency and are constructed in an environmentally friendly manner. Work has already begun on the city’s first LEED structure, the Recreation Center at Livingston Street Park, (shown above) which will house a theater and classrooms for the community. Locally, Waste Reduction Partners offers the expertise of retired engineers to help businesses adopt sustainable practices. Visit www.wastereductionpartners.com. Take the last sip of beer, rinse out the bottle, and toss it in the bin. Done. For many of us, recycling has become second nature, whether we rely on curbside pick-up in urban centers such as Asheville, or drop off materials at community receptacles, like residents in Macon County. Overall, Western North Carolina makes a strong showing in statewide recycling. In 2009, five of our counties ranked in the state’s top 10 for per-capita recycling. Not too shabby considering these counties—Catawba, Buncombe, Swain, Macon, and Watauga—trumped more populated areas, including Mecklenburg, home to Charlotte (ranked No. 14). Scott Mouw with the N.C. Division of Pollution Prevention and Environmental Assistance attributes our successes to the innovative and committed people driving recycling programs. “They aren’t just putting out a few collection centers and waiting to see what happens. There’s a level of effort that is outstanding,” he says. Through its Recycling Makes Cents program, Madison County donates a penny per pound of recycled materials to its local school system. Between July 2009 and June 2010, residents recycled about 363 tons of mixed paper and 239 tons of cardboard, raising $12,021 for education. So how are we doing in terms of promoting sustainability? That depends on whom you talk to, what data has been collected, and how you define green topics. For example, do green jobs include just those within the energy efficiency and alternative fuel and vehicle industries? Or should we include green builders, landscapers, and farmers? Getting a handle on the big picture can be challenging. We hunted down a number of facts that offer some insight into our region’s dedication to sustainability. • There are currently 414 certified HealthyBuilt Homes in WNC and at least 390 in progress. New and older homes that have been retrofitted can qualify for HealthyBuilt status. • There are eight LEED-certified commercial buildings in WNC. The only one in Asheville is the Blue Ridge Visitor Center. Swannanoa has the most with four, all at Warren Wilson College. Boone has one at Appalachian State University, and Waynesville and Cherokee claim one each. • As of 2009, the partner land trusts of Blue Ridge Forever have protected more than 70,000 acres in 25 WNC counties. This includes land purchases and conservation easements. • Bike lanes and bicycle markings (shared lanes and climbing lanes) on roadways are on the rise in the region. The City of Asheville has experienced the most dramatic increase in bicycle road markings just in the past year—doubling its bike-friendly roadways from five miles of markings to 10. • There are eleven biodiesel fueling pumps in WNC. There’s only one business, Blue Ridge Biofuels, that produces biodiesel locally. Some stations and businesses have their biodiesel trucked in from other states, such as Ohio. • There are approximately 100 certified organic farms in the region. About 150 more farms describe their practices as organic, but not certified. • There are three federally licensed Riverkeepers in WNC. One each for the French Broad, Watauga, and Catawba rivers. Five of the region’s rivers currently are registered as national wild and scenic rivers: Chattooga, Horsepasture, New River, Lumber, and Wilson Creek. While it’s easy to connect air pollution with sources such as vehicle tailpipe emissions, the reality is that power generation is our state’s single biggest contributor to greenhouse gasses. Our coal and natural-gas powered stations account for about 40 percent of the pollutants (other sectors like transportation, materials burned for heating, and industrial air pollution are responsible for the remaining amount). This isn’t just an environmental issue but a matter of health, since pollutants like ozone and sulfur agitate respiratory diseases. As the state’s energy grid reaches capacity, more power plants are in the area’s future. Rutherford County will see the new hotly contested coal generator at Duke Energy’s Cliffside plant go online in 2012. But compared with the rest of the state, WNC gets a larger portion of its energy from carbon-free hydroelectric plants. Thanks to man-made lakes like Fontana, our area has four of the state’s seven 100-plus megawatt-hour hydro plants, and we have many more small hydro generators operating along riverways. At least in that regard, we can breathe a little easier. According to wind speed studies by the National Renewable Energy Laboratory, our area has many promising sites for wind power. The problem is that they’re along mountaintops and ridgelines, and conflict with ridgeline development laws designed to protect scenery. A recent study by U.S. Energy Information Administration and the N.C. Utilities commission found that among all energy-related investments, conservation technologies and solar water heating offered the best value in kilowatt hours returned to the electric grid. Now in its 10th year, this event is the largest green building and sustainable technology exposition in the South. Businesses and conservation organizations will supply information on green enterprises, organic agriculture, energy-efficient products, solar energy systems, solar ovens, wind generators, and more. Each day, speakers and forums will explore a range of environmental topics. GreenPower add 100 kilowatt-hours of renewable energy (equal to 500 pounds of carbon dioxide) to the electric grid. Visit www.ncgreenpower.org.